Rachel Renee Russell's sequel to Dork Diaries is packed with adorable art and tons of laughs. 1. Nikki is starting at a new private school. How does she learn about the culture of the school and figure out who is trustworthy? Have you ever had to start over at a new school? If yes, how did it feel? If no, how do you think you would act the first few days? 2. When Nikki’s mom tells her she’s getting a back-to-school present that will help her “communicate her thoughts and feelings,” she is so excited because she thinks it will be a new cell phone. Instead, Nikki’s mom gives her a diary. Nikki is incredibly disappointed, not just because she didn’t get a cell phone, but also because she thinks a paper diary is outdated. Despite her initial resistance, Nikki ends up writing a lot in her diary. Do you think paper diaries are outdated? Would you rather share your thoughts and commentary about school life privately in a diary, or more publicly using an online forum such as a blog or social networking site like Facebook? 3. Nikki feels that her bedroom should be her own private space. At school, she, Chloe, and Zoey use the janitor’s closet for their meetings. Do you have your own bedroom or another special space that feels like it is all your own? If so, who makes up the rules for this special place? If you could have complete dominion over your space, what would be your top three rules? 4. At first, Nikki thinks Chloe and Zoey are kind of annoying, but she gets past her first impression of the pair when they all bond over their shared dislike of MacKenzie. As the story progresses and they become closer friends, we see more of their shared interests and also their differences. What do you think makes a good friend? How do the girls demonstrate these characteristics? 5. Sometimes family or close friends develop their own special ways of communicating through shared gestures and vocabulary, secret handshakes, and other signals. For Nikki, Chloe, and Zoey, the language of friendship already includes jazz hands, the stinkeye, and a lot of acronyms like CCPS (Cute, Cool, and Popular), 4Fs (Friends, Fun, Fashion, and Flirting), and GGG-ing (Giggling, Gossiping, and Glossing). Some of them come from magazines or popular culture, and some seem to be the girls’ own inventions. What are some of your favorite words, phrases, gestures, and inside jokes you share with your family or friends? 6. Do you think the “thank you for the oatmeal” note Nikki’s mom leaves is sincere, or is she trying to let Nikki know that she is on to her deception but forgives her? Either way, Nikki is very relieved that she’s not in trouble. Have you had a close call where you thought you were busted but ended up being just fine? What happened? 7. Several times when Nikki is writing about a conversation from earlier in the day, she includes her own very honest and blunt reply, then explains, “But I just say it inside my head, so no one really hears it except me.” When is it good to self-censor? When would it be better to speak up? How can we learn to tell the difference? 1. Nikki’s arch nemesis MacKenzie continues torturing her in this second Dork Diaries volume by calling her names, making fun of her clothes, and dissing her friends and artistic talent. Do you have an arch nemesis? What makes this person your ultimate rival? What would you do if you had lockers next to each other? 2. Nikki finds out that she won $500 in the Avant-garde Art Contest. She had originally planned to use the money to buy a cell phone, but decided instead to save the money for art camp next summer. If you won $500, what would you do with it? 3. Nikki admits that her major crush on Brandon has caused RCS (Roller Coaster Syndrome). What does this mean? Have you ever had this feeling when you are around someone you have a crush on? Does it impact your ability to talk to him or her? 4. Throughout the book, Nikki continually talks about how she is so unpopular, ranking herself lower on the WCD CCP Popularity Index Chart than the school janitor, school mascot, and head lunch lady. 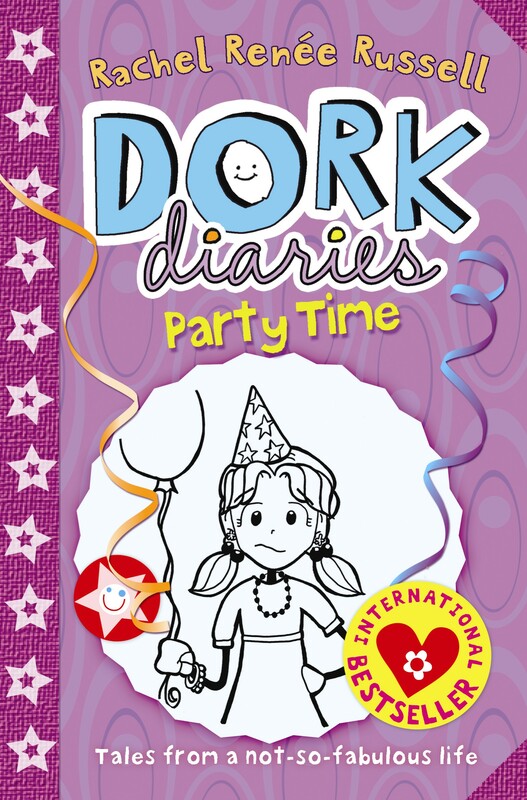 In fact, she calls her own diary the “Dork Diary,” and often refers to herself as a dork throughout the book. However, Nikki has several best friends and a popular boy has a crush on her. How do you define popularity? Who determines who is popular at your school? Do you think how you view yourself impacts how others view you? 5. Nikki’s mom always wanted to be a ballerina, so she signed up both her daughters for lessons, even though neither of them wanted to attend ballet classes. Have your parents ever forced you to do something you didn’t want to do? How did you respond? 6. During MacKenzie’s party, Jessica “accidentally” bumps Nikki’s plate of fruit and chocolate, causing the entire plate of food to spill all over Nikki’s new party dress in front of everyone. Out of embarrassment, Nikki leaves the party and doesn’t even take the opportunity to talk to her crush Brandon, as she is waiting around outside for her dad to pick her up. Have you ever been embarrassed by someone else in front of your peers? How did you handle it? If you could go back and respond differently, would you? What would you do differently? 7. In response to her little sister’s fairy phobia and constant pleas for a bathroom monitor in the middle of the night, Nikki comes up with a plan to banish the imaginary tooth fairy in Brianna’s room for good using a homemade repellent made with water, vinegar, tuna fish oil, sardine oil, and garlic. What’s the most unusual thing you have ever done to get your brother or sister to stop bothering you? 8. In Nikki’s own words, she was trying to “do it ALL” on Halloween, including paint faces at the ballet class Halloween party, attend the Halloween dance with Chloe and Zoey dressed as a bag of trash, and attend the Halloween dance as Brandon’s date, dressed as Shakespeare’s Juliet. Have you ever found yourself in a situation where you took on too much at one time? Were you successful? How would you do it differently if you had to do it over again? 1. Nikki discusses some of her fears in Dork Diaries 3. What was your biggest fear when you were little? What about now? 2. Why do you think Nikki’s parents decide to deliberately create Family Sharing Time? Does your family do anything like this? Nikki suggests her family do an extreme sport, like bungee jumping, together. What are some activities that you think would be good for Family Sharing Time? Why? 3. Nikki worries a lot about being seen doing things like dancing at Queasy Cheesy or getting dropped off in the roach van. Why can a situation be okay when nobody sees, but humiliating if observed? Why do we care? 4. Nikki doesn’t approach her mom about the video problem, her dad about the bug problem, or her friends about either problem. In the previous books, Nikki has also kept her problems to herself—even though her friends constantly prove loyal and helpful. Why doesn’t Nikki share her problems with others? Find three examples in the book that support your answer(s). 5. Language can be very powerful. Nikki and her friends decide to embrace the label “dork” when naming their band “Dorkalicious.” What happens when someone claims what might be considered a negative label, like “dork,” with pride? 6. Nikki writes that she is not jealous, because “How juvenile would THAT be? !” Her denial seems a bit too passionate to be believed, though. Do you ever get jealous even though you know you shouldn’t? How do you deal? 7. Nikki’s eccentric grandmother comes to visit for Thanksgiving. We learn that she belongs to an elderly Segway gang and takes road trips. If you have grandparents or older friends/family in your life, what do their lives look like? How are they similar to and different from Nikki’s grandma? What characteristic of theirs would you most like to possess when you get older? 1. Take the “Discover Your Diary Identity” quiz in the book. Do you think the result accurately describes your personality? How would YOU describe your personality and habits? Is Nikki's suggested diary-keeping format (based on your quiz results) the one you would be most likely to use for keeping a diary? Why or why not? Can you think of any other ways someone could keep track of their daily thoughts, emotions, and activities? 2. Why do you think Nikki writes, “Make sure you write in your diary every single day” even if you lose the original diary and have to write in a spare notebook? Why is keeping a diary important? 3. Several times in this book, Nikki initially discounts her friends’ assistance and then is pleasantly surprised by the help and support they offer. For example, Nikki finally shares her problem with Chloe and Zoey and feels so relieved to have their help. When Nikki finally pays attention to the gift Brandon is trying to give her, it turns out to be really sweet and helpful. Have you ever discounted a friend's assistance at first and later accepted it? What happened? How did you feel? 4. Chloe goes Dumpster diving in search of Nikki’s diary. You’ve probably heard the saying that one man’s trash is another man’s treasure. If you cleaned out your old “junk,” unwanted gifts, and outgrown clothes to sell or donate, what kinds of things would you get rid of? What would you be delighted to spot at a garage sale or discarded at the side of the road? 5. Tongue-tied at being discovered in the boys’ locker room, Zoey blurts out a quote from former President Franklin D. Roosevelt: “Men are not prisoners of fate, but only prisoners of their own minds.” In his first inaugural address, FDR also said, “the only thing we have to fear is fear itself.” What do you think these two quotes mean? 6. This whole book is about Nikki’s missing diary. What would you do if your diary went missing? Where would you look? Who would you blame? Even if you don’t keep a diary, imagine you discovered that everyone at school suddenly knew one of your biggest secrets. How do you think that could happen? How would you respond? 1. Have you ever felt completely overwhelmed by the task ahead of you? What would it take for you to step up to a challenge that previously seemed impossible? What techniques can make a large task more manageable? 2. Nikki decides she must beg MacKenzie to skate in her place, so they’ll be able to earn money for Fuzzy Friends. 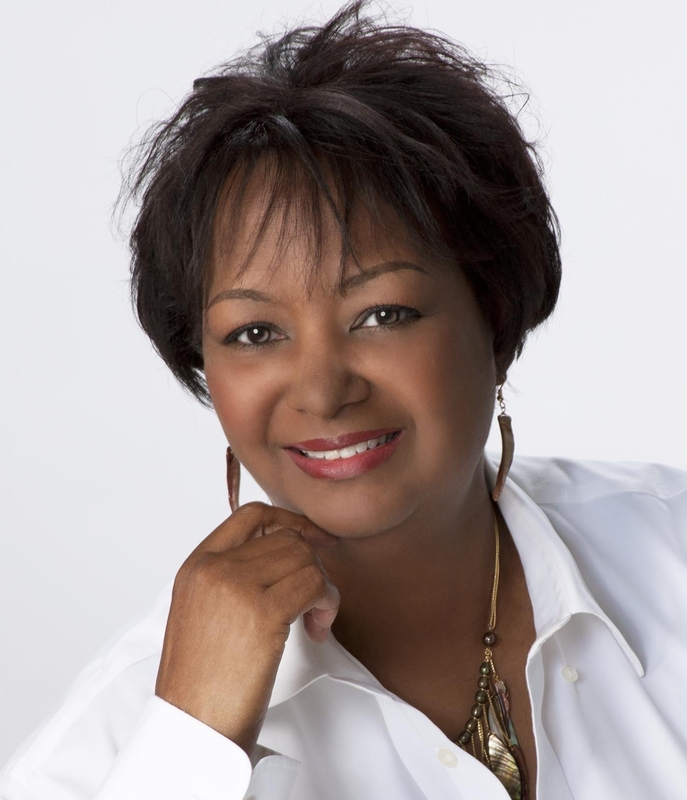 Have you ever had to put your group’s success above your personal desires or your ego? Why? What did that feel like? If you haven’t ever done so, in what circumstances do you think you would? Would it be easy or hard for you? 3. Nikki loves Lady and the Tramp and easily imagines herself in the classic romantic spaghetti dinner scene. What’s your favorite movie from childhood? How could you imagine yourself in a scene? Describe the setting and any friends you would cast beside you. Would you tweak anything from the original script, or would it play out pretty much the same in your life? 4. Even though MacKenzie cheats and pulls all kinds of mean tricks on Nikki, Nikki explains that because she wants to “be nice and show good sportsmanship,” she chooses not to taunt MacKenzie about the competition results. How do you define good sportsmanship? Provide three examples each of good and bad sportsmanship. 5. MacKenzie’s behavior to Nikki and her friends throughout the Dork Diaries series could be considered not just bad sportsmanship but actual bullying. Have you ever been bullied or acted like a bully? Why do you think people bully others? What is the best way to respond to a bully? 6. Nikki feels like she can’t ask Brandon what his hug means because doing so would betray her interest, so she feigns nonchalance and overanalyzes inside. Have you ever wanted to know something but been embarrassed or afraid even to admit you wanted to know? What, if anything, did you do to try to find out the answer to your question? 7. Nikki keeps Brandon’s secret, and she doesn’t even tell him that she knows. If you discovered a big secret about one of your friends, what would you do? 8. Nikki and her friends help in the library and read a lot. Throughout the Dork Diaries series, they refer to various trends in literature, film, and popular culture, like vampires, werewolves, and zombies. What is your favorite current trend? Least favorite? Why? 1. Nikki, Chloe, and Zoey each describe the characteristics for their ideal boyfriends. What would be the most important ingredients for your dream date? Why? 2. During their New Year’s Eve sleepover, the three girls play Truth or Dare. Which do you think takes more courage, sharing some information or doing some deed? Why? Why do you think this game remains popular over time? 3. The more Nikki considers all the ways MacKenzie has mistreated her, the more she thinks maybe Zoey is right that it’s time for payback. How can your friends affect your decision-making? Is there a line that, once crossed, would tempt you to seek revenge? Can you relate to Nikki’s description of ignoring the little voice of caution in your head? If so, how do you normally feel afterwards? 4. In the book, there is a list of positions on Nikki’s school newspaper available for new students. What role would you want on a school newspaper? Why? What role would you be least comfortable serving in, and why? 5. Nikki asks her best friends for advice. Their classmates write Miss Know-It-All for advice. Who can you ask for advice? Do you ask different people in different situations, or do you have one go-to person for most any problem? Does anybody come to you for advice? Why or why not? 6. 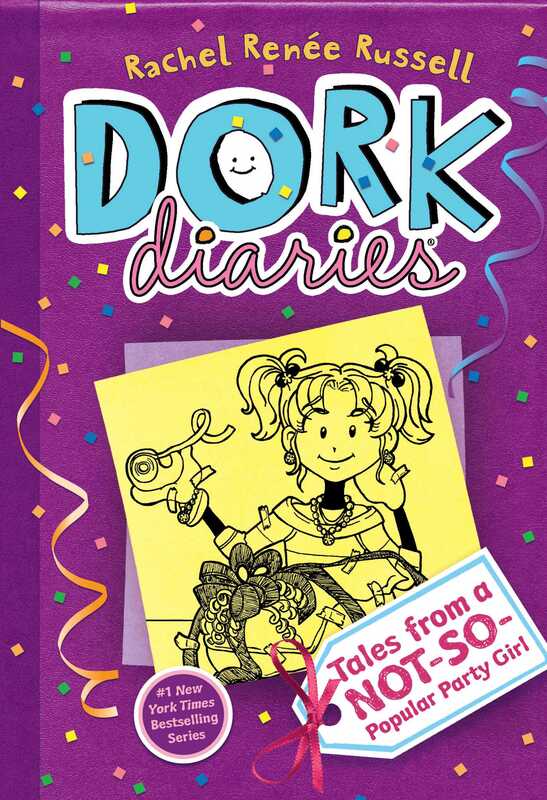 Throughout the Dork Diaries series, Nikki has given many different kinds of gifts to her friends and family, including budget-saving handmade items, last-minute convenience presents, cherished items that are hard to share, and gifts that might also benefit her—like a dinner gift certificate for two. How do you decide what presents to give your friends and family? What’s the best gift you’ve ever given? The worst? This discussion guide is designed to help your students engage with the text through discussion in small or large groups. 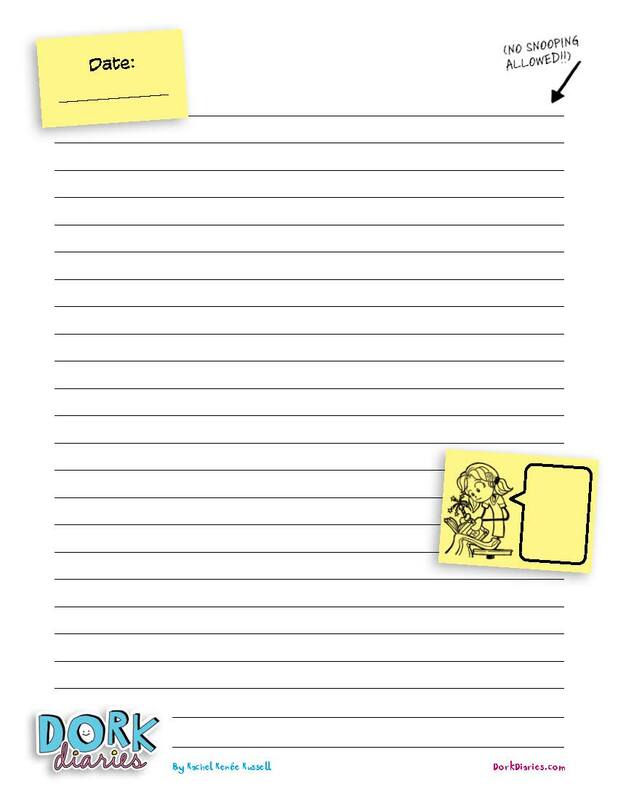 The discussion questions can also be used as writing prompts for independent work. The nature of the questions themselves, as well as the variety of suggested response formats and opportunities for interaction with peers, will help students develop proficiency in many of the College and Career Readiness (CCR) anchor standards for Reading, Writing, Speaking and Listening, and Language. Guide was written by Michele Gorman, author of Getting Graphic! Comics for Kids and Getting Graphic! Using Graphic Novels to Promote Literacy with Preteens and Teens.